"Let’s have some gender balancing, and I got three really great women fiddle players"
Frankie Gaviin and The Provenance. FRANKIE GAVIN, Gradam Ceoil’s 2018 Traditional Musician Of The Year, and long-time stalwart of De Danann, has launched a brand new, high-octane fiddle group, The Provenance, who play the Town Hall Theatre on Saturday June 3 in a gala birthday celebration for Tigh Choilí. 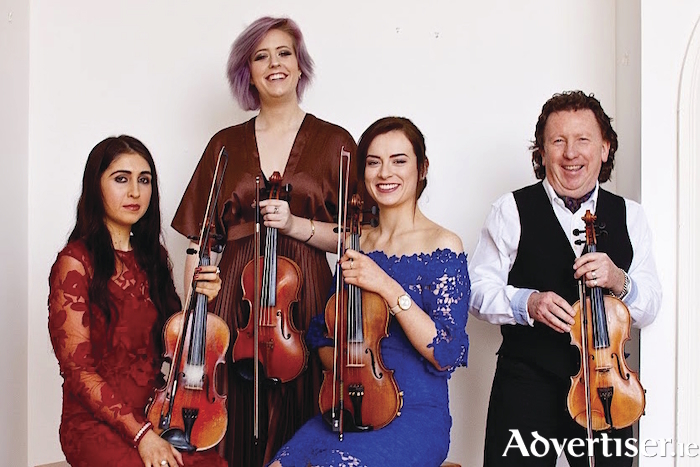 Led by Gavin, The Provenance comprises Sorcha Costello, Eadaoin Ní Mhaicin, and Ciara O’Brien, three powerful, highly experienced fiddle players and stars in their own right. They have won numerous awards and All-Ireland competitions, and toured the world both as solo performers and in a range of groups and orchestras. The full line-up also includes accompanists George Grasso (bouzouki ) and Brian McGrath (piano ). Last Friday afternoon, I caught up with Frankie to chat about The Provenance and his other upcoming Galway gig, with harmonica wizard Rick Epping. The previous night Frankie had been at Croke Park to see his old buddies The Rolling Stones strut their stuff. "It was a great gig, they were on top form," he enthused. We can be sure Frankie himself, and The Provenance, will also be on top form and deliver a great gig in the Town Hall. He tells me how the band came together. “I was recording in California last year," he says, "and did a couple of tracks with two fiddles and brought them back to Ireland and started adding stuff onto it, like Brian McGrath on keyboard, and a few more fiddle tracks of my own. Then I thought it would be great to have a team of fiddle players and I could have more fun doing tunes and playing around with them, because I love to improvise and do harmonies and stuff like that when playing. It would be great to have a few other fiddle players onstage. As well as his Town Hall gig, Frankie will be in action for The Galway Sessions festival where he will perform with Rick Epping at the Róisín Dubh on June 14. “I did an album with Rick a few years back on the Greentrax label in Scotland, called Jiggin’ the Blues,” he tells me. “Rick was in Pumpkinhead back in the day and he had been living in America for years.